Bitdefender 60-Second Virus Scanner – fast and easy anti-virus scanner, which uses cloud and proactive technology for instant detection of active viruses that are lurking on your computer. Bitdefender 60-Second Virus Scanner – fast and easy anti-virus scanner that analyzes your computer for active malware using proactive scanning engine and cloud-scanning technology. The application needs no more than 60 seconds to complete the scanning system as indicated in its title. The scanner is compatible with other antivirus software and requires a minimum of system resources. When the scan is completed the computer, Bitdefender 60-Second Virus Scanner provides a report that shows the possible problems in the security of your system. Free to download, easy installation. Bitdefender 60-Second Virus Scanner – a free and easy-to-use anti-virus scanner, which uses advanced technologies to scan, to warn you of active viruses that are lurking on your computer. Unobtrusive proactive scanning. With technology Bitdefender Autopilot, 60-Second Virus Scanner automatically scans all the processes in the background – this time you can do any chores on your computer. Instant verification and weekly reports. The application uses a scanning “in the cloud” for the detection of malicious programs and threats in less than 60 seconds, and provides information on the security status of your system and third-party applications (anti-spyware, firewall). Cloud technologies. Bitdefender 60-Second Virus Scanner takes full advantage of cloud computing scanning. No effect on system resources, the application works fine with any other antivirus programs. Advanced protection for your computer. Even if you already have an antivirus scanner offers an additional check for your anti-virus solutions. This free app adds an extra layer of protection for your computer. 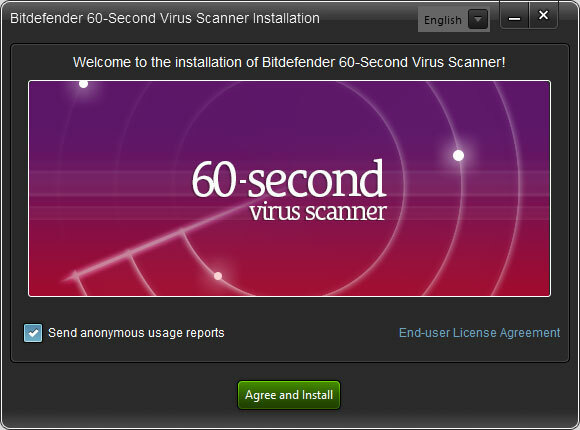 A copy of the scanner can be downloaded from the developer – http://www.bitdefender.com/solutions/60-second-virus-scanner.html .